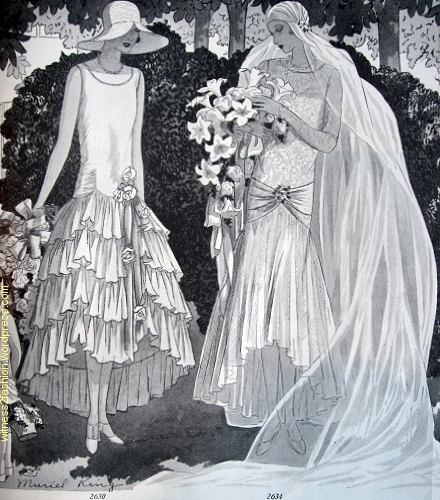 Maid of Honor and Bride, Delineator magazine, May 1929. Just in time for June weddings, The Delineator’s May issue suggested these Butterick patterns for the bridal party and guests. It’s a little late to make these gowns for June, 2015, but in case you’re dreaming of a retro wedding, here are five designs from a very lovely period of 1920’s fashions. The bride and her maid of honor are wearing full-skirted gowns — see other robes de style in my last post, about Lanvin. 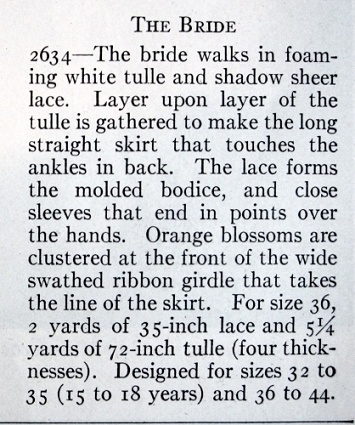 I noticed this wedding article while looking for other examples of transitional hemlines from the late 1920’s; hems that were long in back and short in front — or simultaneously long and short in other ways — anticipate the longer hems of the 1930’s. 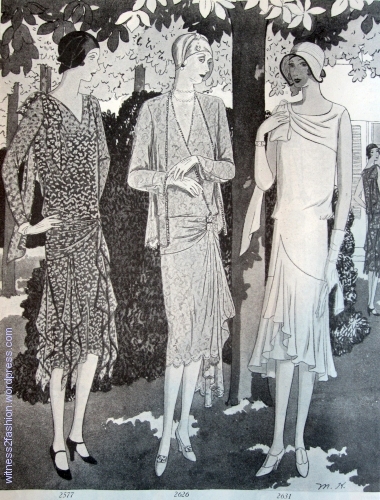 Butterick bridal pattern 2634, The Delineator, May, 1929. 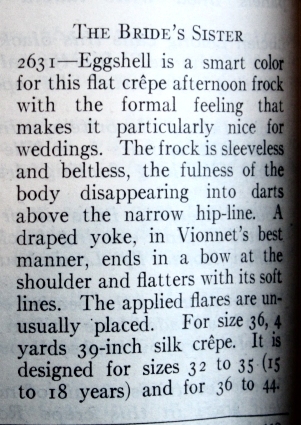 Elsewhere in The Delineator, this same pattern was offered as an evening dress. See Other Versions, at end of post. This sleeveless gown is suggested for an outdoor wedding. 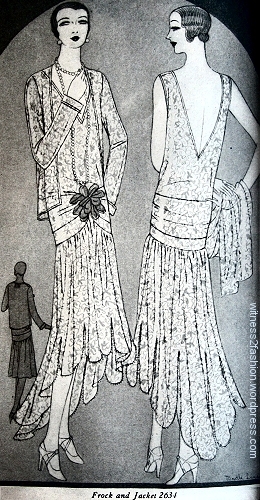 Butterick pattern 2630, suggested for a Maid of Honor, The Delineator magazine , May 1929. 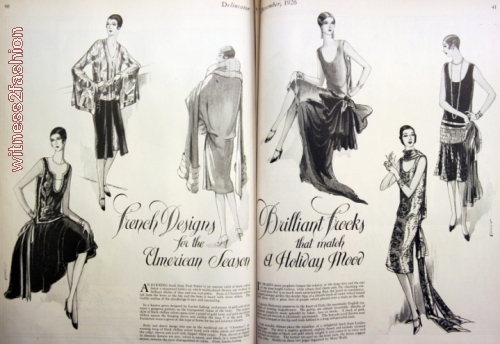 Butterick patterns suitable for wedding guests, Delineator, May 1929. Both the dress and the jacket hems are scalloped. 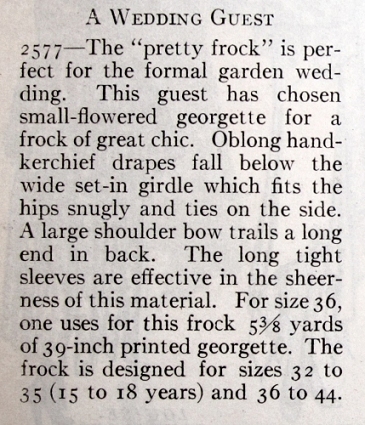 Butterick pattern 2626 is suggested for the Mother of the Bride, Delineator, May 1929. A note to modern brides and wedding parties: bare arms were not acceptable in some churches even in the 1970s. A wedding was not thought of as an opportunity to look as “hot” as possible, but to exchange solemn vows. A lace jacket was a way to be modestly covered up during the ceremony; the jacket could come off for dancing after the wedding. 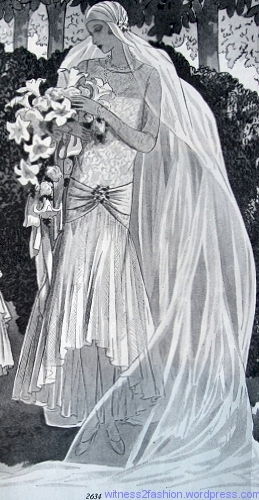 Nevertheless, since this is described as a “formal garden wedding,” the bride’s sister is shown in a sleeveless dress. Butterick pattern 2631 was suggested for the Sister of the Bride. 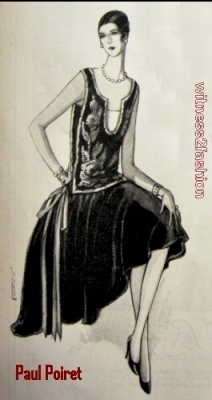 Delineator, May 1929. 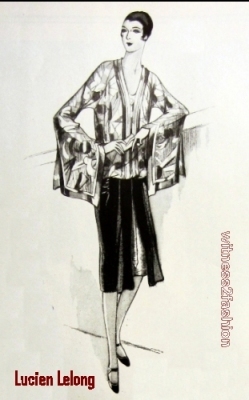 “A draped yoke, in Vionnet’s best manner, ends in a bow at the shoulder and flatters with its soft lines. The applied flares are unusually placed.” In this case, the skirt appears to be longer at the sides. 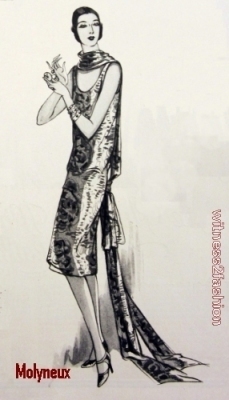 Wedding guest, Butterick pattern 2577, Delineator, May 1929. 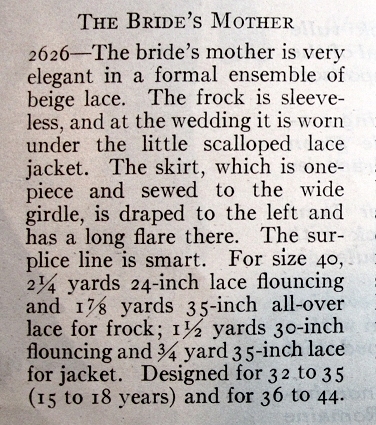 In May, the wedding dress pattern (2634) was also illustrated as “the most important formal evening gown of the month,” made sleeveless, with a deep back decolletage. Recommended colors for this lace gown are beige, “string,” lake blue, black, and yellow. 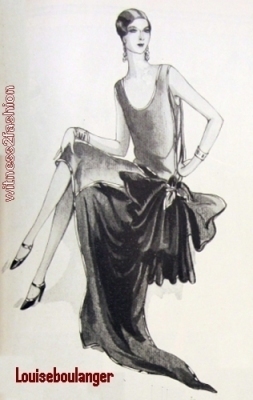 Butterick pattern 2634, “the most important formal evening gown of the month.” The Delineator, May 1929. In this version, the skirt is cut in long scallops. In June, the same wedding dress pattern, No. 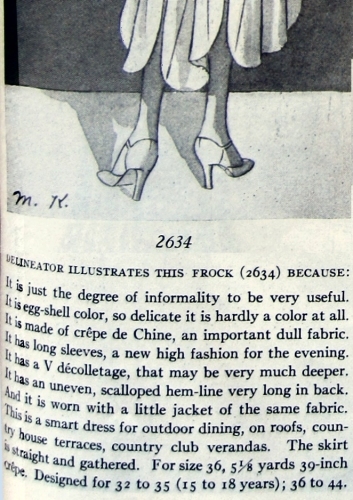 2634, was described as ” a smart dress for outdoor dining, on roofs, country house terraces, country club verandas.” Here, the back decolletage is less revealing. 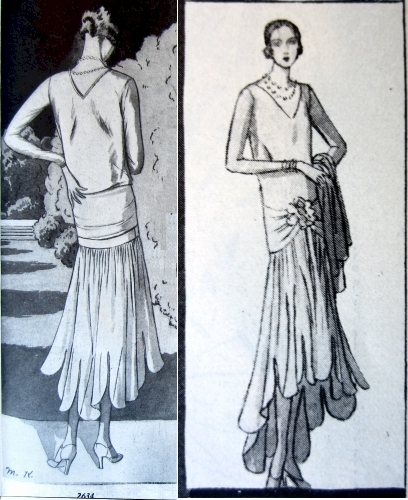 Butterick 2634 illustrated in The Delineator, June 1929. This is a good illustration of the importance of taking fashion descriptions with a grain of salt. 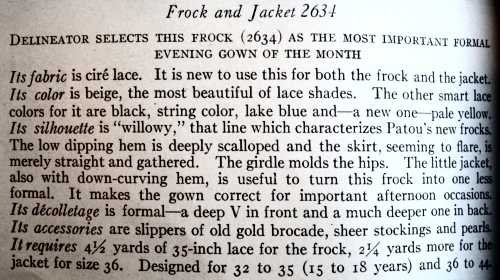 The dress that was “the most important formal evening gown of the month” in May, has “just the degree of informality to be very useful” in June. 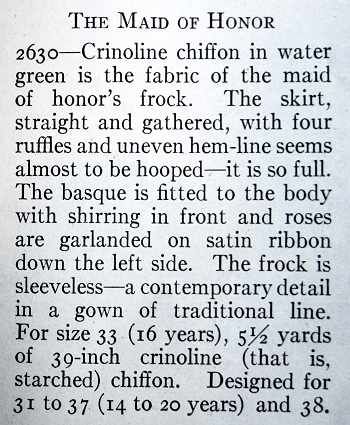 Presumably the difference lies in the decolletage, and in the difference between lace and “crepe de Chine, an important dull fabric.” I’m thinking that those scalloped edges would be easier to hem in printed chiffon or crepe de Chine than in lace!